The advantage of the this smaller size of brushless DC motor is that it can be applied to equipment with strict requirements on installation space, such as the AGV vehicle popular in recent years. Because of the limited entire size of the AGV vehicle, the purpose of AGV vehicle development is to have convenient operation and reduce the coverage area, so that the AGV vehicle of the manufacturing workshop can shuttle back and forth in various workshops. AGV vehicle guides the operation of the unmanned carrier through the electromagnetic field formed by low-frequency guidance cable and electromagentic sensing device, so it requires the motor driving, and the motor should be in small size as much as possible. That's why brushless DC motor can be applied. In addition, the motors such as the traditional three-phase asynchronous motor not only have big size, but also heavy weight. The instruments, such as the aerospaceplane, are constituted by a large amount of components, each component is required to be as small as possible. 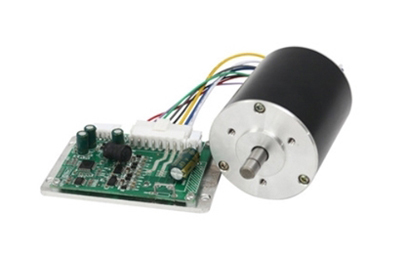 The birth of brushless DC motor provides a good choice for them. Moreover, the apparatus in the hospital, the transmission device used in the military field and so on also require motors of small size. Since the size of brushless DC motor is much smaller than that of the motor with the same capacity, this is also one advantage of brushless DC motor surpassing the traditional motors. The advantage of brushless DC motor than the motor of the same capacity is not only reflected in the smaller space installation, but also lies in the extensive supported functional characteristics. For example, it is very convenient in connecting portable power sources, because it can be connected with both domestic and industrial voltages, from the lowest 12V to 24 V, 36 V, 72 V, 110 V, 220V, 310V. Furthermore, it still has very wide speed adjustable range. The model airplane, precision instrument and meter are very strict in the revolving speed control of the motor. The devices produced by some device manufacturers raise very high requirements on the revolving speed. In addition to the fixed revolving speed 3000, brushless DC motor can also adopt lower or higher revolving speed, or reach high speed by utilizing the driver on the basis of the original revolving speed. Therefore, it can be said that it has very wide supported speed adjustable range. In addition, from the perspective of advancement and intelligentializing, it can support 485, CAN communication, position control, user-defined programming control and so on. More infomation about this small brushless dc motor or buy it online, please feel free to contact us.